Kon Sihong points to the humorous sign in front of his ‘Chicken & Gourd Phit(sanu)lok Noodles’ shop. Knowing many people consider one noodle shop to be as good as the thousands of others, a Sattahip restaurateur has figured the best way to people’s stomachs is through their funny bone. 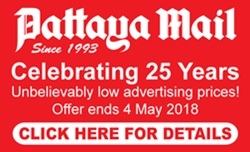 An eye-catching sign erected on Sukhumvit Road directs diners to the ‘Gai Mara Pitlok Noodles’ restaurant two kilometers up the street with a slogan many Thais found humorous. 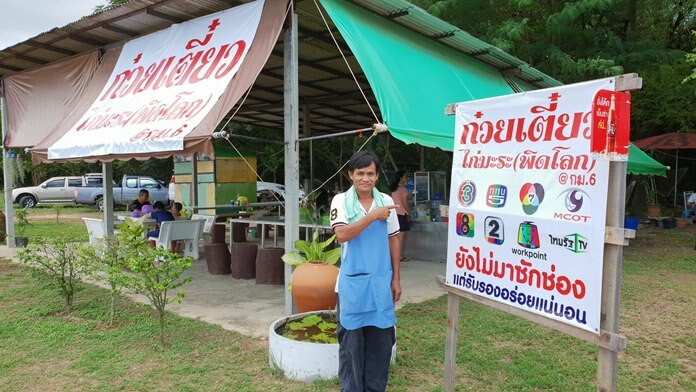 The sign carries the logos of television channels 3, 7 and 9, MCOT, Workpoint among others, and, below them, says “so many channels, but none of them have been here. But we guarantee that the noodles are to die for”. Clearly, the humor got lost in translation. Nonetheless, the noodle shop owned by Phitsanulok-native Kon Sihong, 52, is busy every day. Kon, who moved from the central province to live with relatives serving in the navy, said that with so many places cooking up noodles, he needed something to set his place apart and have people try his Phitsanulok-style dishes.